Autumn has arrived and so has our seasonal sale, so as well as all those falling leaves, you’ll find loads of falling prices too. We have discounted over 300 of our products, with gifts, books, kitchenware, pet accessories and items for the garden all on offer. You’ll find something for all the family, and you might be able to pick up some early Christmas presents too. See what’s on offer and make some great savings today! Squirrel & Acorn Magnet Set– We’ve seen one or two Squirrels around lately, but this one will prove most handy to have in the home. Use the acorn magnets to pin up your paperwork and keep organised. Beehive Tea Cosy – It’s not just people that need an extra layer to keep warm in Autumn, it’s teapots too, and this tea cosy will keep your cuppa nice and toasty. 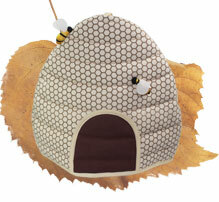 We think it’s rather a bee-auty too! 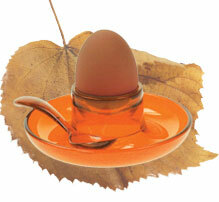 Guzzini Egg Cup Set in Orange – The perfect egg cup for your breakfast this season. 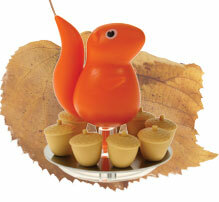 This vibrant orange egg cup and matching spoon will complement that rich yolk beautifully.